MENEZES, Philadelpho. Poetics and visuality: a trajectory of contemporary brazilian poetry. Translated by Harry Polkihorn. 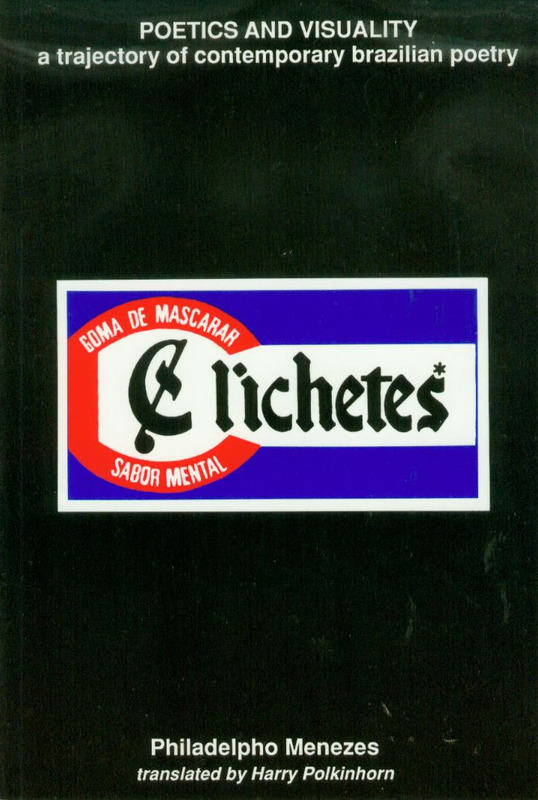 San Diego, California: San Diego State University Press, 1994. 230 p. ilus. 15x22,5 cm. 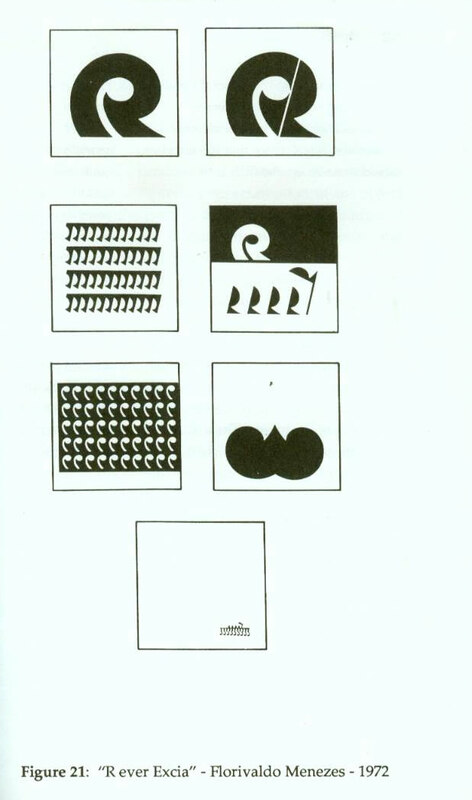 (...) Florivaldo Menezes's "R EVER EXCIA" (1968/ 1969), created with the logo of an automobile consortium, from the name "Reunos" (Figure 21). In this poem, the design of the sign R (theory of semiotic poetry) sets free a movement of non-figurative forms (process-poem) that, in the context of the poem, by virtue of the method of articulation of forms, assumes an intelligible connotation (as in Azeredo's "chicken chic"). Similarly; it starts from the logo created with the letter R, initial letter of the consortium's name, which, on being dislocated from its symbolic function as a sign, assumes a reverential posture. Through three stages present in the sectioning up of the logo, a series of apparently abstract forms develops, but which can be read as symbols of royalty: a military parade, with the soldiers' boots or the public watching; a white horse or a grandstand looking down over an avenue with a parade escorted by a flag-bearer; the official discourse of quotation marks; noble moustaches of the speaker, originating in the 'The Little King", cartoon characters, moustaches that are also two initial R's side by side , and are represented by the caravel, with standard, sails, and oars, summarizing and blending together all the preceding visual forms. The analysis of these three poems shows clearly a way that leads to visual poetry: it starts from the experiences of the most recent movements, and, without any apparent critical awareness whatsoever on the part of these creators, it modifies, point by point, the theoretical premises which directly influence it. In the figure below, we see the principle postulates of the preceding movements and the innovations that appeared. Three elements emerge, helping us to understand the foundations on which we can begin to erect a poetic language distinct from preceding movements. They are these: non-calligram figuration, montage syntax, and a semantics of the image. These three elements, delineated in the three poems above, will have to separate themselves in the development of production from the antecedents which gave rise to them and embark upon the compositional procedures most typical of a vast and diverse visual poetry. These three elements situate the three poles of existence of the sign: the sign in relationship with the object it represents; its relation to other signs; and what this relation projects into the reader's mind. Let's now turn to an analysis of "visual poetry" using these three parameters. 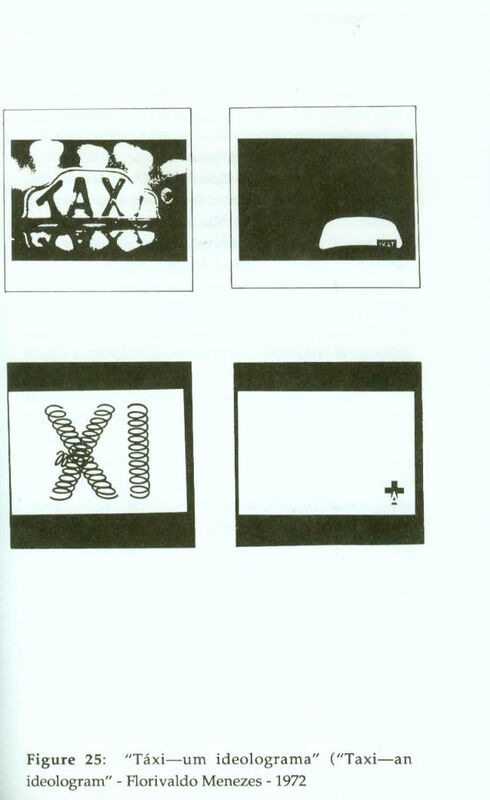 we should decipher the elementary level of the signifieds of the poem's images to know the disaster of the taxi seen by a pedestrian (the taxi seen from the front, the taxi seen from behind, the loose springs suggesting the wreck and the exclamation "XI," and the gravestone cross of the letters "ta"), After this capturing of the images' "referents," we should pass on to a reading of the meanings which the poem permits, in accordance with the repertory and the preoccupations of each reader. We would give an interpretation of the lexical disaster to configure the disaster of cursive reading and the disintegration itself of verbal linearity, manifest in the effacing of the word in a poem that uses narrative to destroy it. But this interpretation is only one that is made, in view of the preoccupations of the present study. However, we can produce others, deriving from the contents of the word "ideologram," understanding the poem as an approach to the question of reception represented by the role of the passenger who does not stop the taxi, that is, does not get the message that passes before his sight, or even of the taxi-message itself that, not being caught by the receiver, is destroyed. Finally, this analysis tries to point out varieties of potential interpretation that are given us by a poem through the "visual charade" that is the initial deciphering of the signifieds of the image. If the poem is reduced to the deciphered signifieds in the "charade/' we would have to conclude that it would be a nothing more than a formal, visual-plastic exercise.